Tapas are snacks offered alongside a beer, wine or soft drink. Usually a small quantity of food, offered to accompany the refreshment. This tradition goes way back in time, although it is unclear exactly when. Tapas may even pre date the 15th century. Cervantes mentions snacks called llamativos in Don Quixote. The word tapa itself is relatively new, perhaps from the turn of the century. The first printed appearance of the word from the Alhambra magazine is in 1911. Without doubt the tapa is an Andalusian custom. Originating in Southern Spain, perhaps Cadiz but no-one really knows the true origin. The word Tapa means lid. Its thought that the snack was used to cover the top of the glass. Creating a barrier to prevent flies going into the wine or drink. 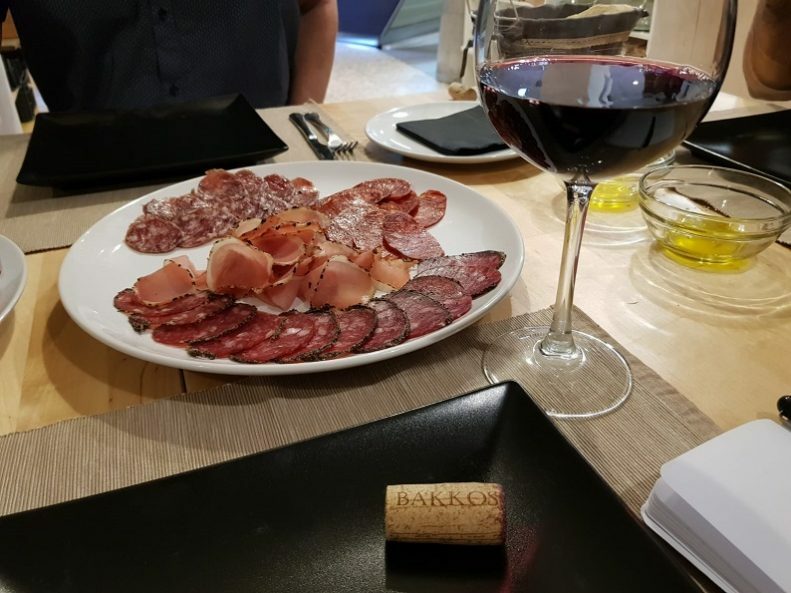 The first tapas were simple slices of salchichon, served on top of the wine glass. Later became increasingly elaborate as time went on. To find out more about Spanish Tapas and Andalusia Food culture join me on my Like a Local Food tour. The third Thursday in June is World Tapas Day and this typical Spanish custom is celebrated across the world with showcooking, special events and menus. Lookout for it if you like Spanish cuisine. This year it is on Thursday 20th June 2019. In Southern Spain there are some cities which are known for their free tapas. I´m lucky to live in one of them: Granada. Also nearby the cities of Jaen & Almeria also offer complimentary snacks with drinks. When you go to a tapas place serving free tapas, you get what that have that day. Sometimes there isn´t a choice.As you drink a second or third round the tapa is different. 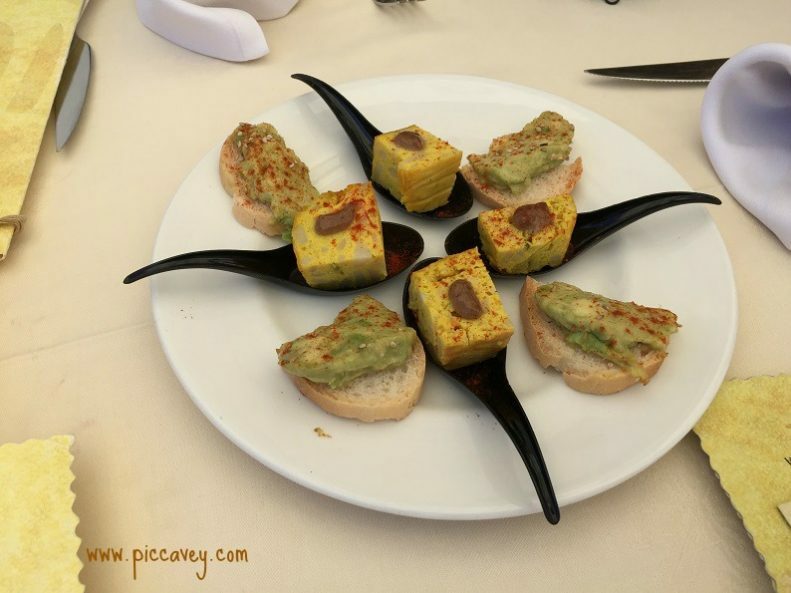 This photo above of Guacamole on white bread with some cold cuts and olives was a complimentary tapa in Granada we didn´t choose it. Then some other places have a different system. Blackboards or menus on tables with tapas lists of their selection. You choose. This menu pictured above is from a tapas bar in Almeria. The free tapa I choose is called a Tuna Cherigan. Depending on the bar, some don´t like to prepare four different tapas for four people. They may suggest two kinds of tapa for one group or family. It depends if they are busy and how they are organised. 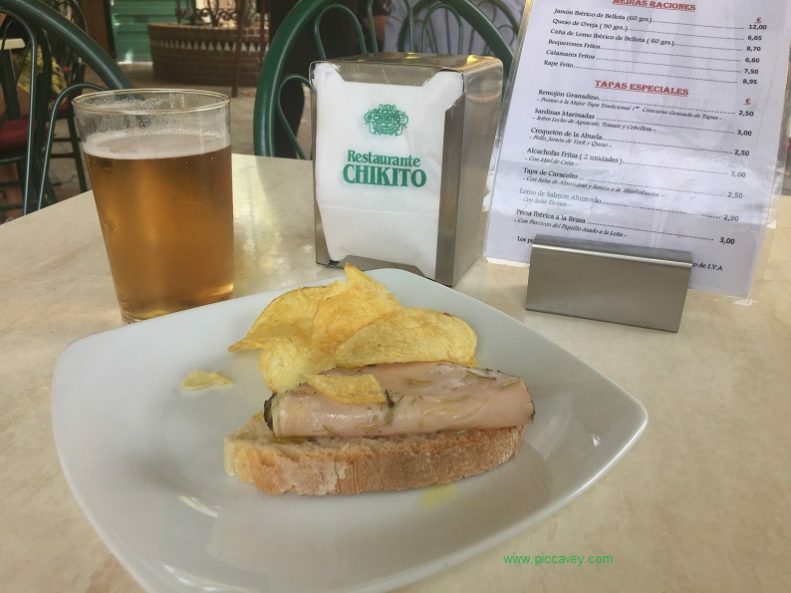 The ´free´ tapa is usually accompanied by beer or wine which costs anything from 1.50 euros to 2.20 euros depending on the place. (Current prices I´ve seen in Granada this Aug 2012) But you can also purchase tapas seperately in most places. 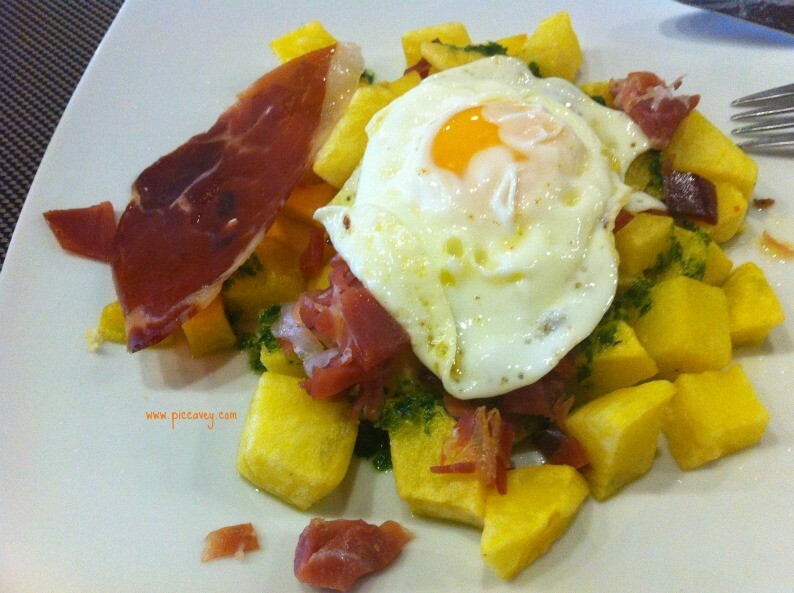 Referred to as a ´Tapa Extra´ This is great if you are hungry or don´t want to drink too much. Some places don´t offer a free tapa at all. Yet do offer tapas to buy seperately from the drinks. This is a good way to have a taster of something and try new food. Or have an aperitif before dinner. This is a double edge sword as some diners just stick to the free tapas and don´t ask for other items from the menu. This style of dining often doesnt scractch the surface and you are not getting the house speciality or the best quality food from the kitchen through the complimentary tapa. Be sure to ask the waiter about the most popular dish in the restaurant, once you have had the first tapa. It may be a delicious ´racion´ for 8-10 euros. Usually locals have the tapa as they intend to go home for lunch or dinner. It´s just a social thing to have a quick beer on the way home with a friend or colleague. It´s not something they do everyday. This is a portion of a food. 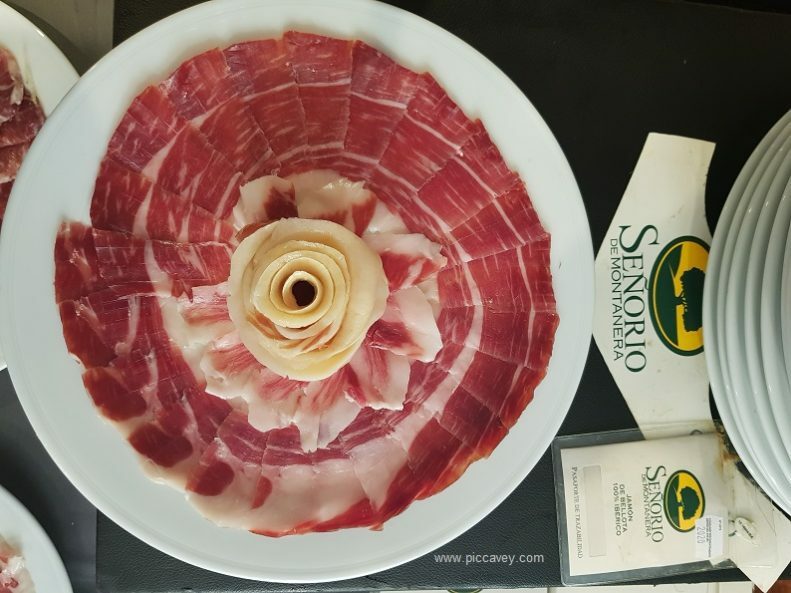 Spanish ham, jamon iberico is typically served this way. 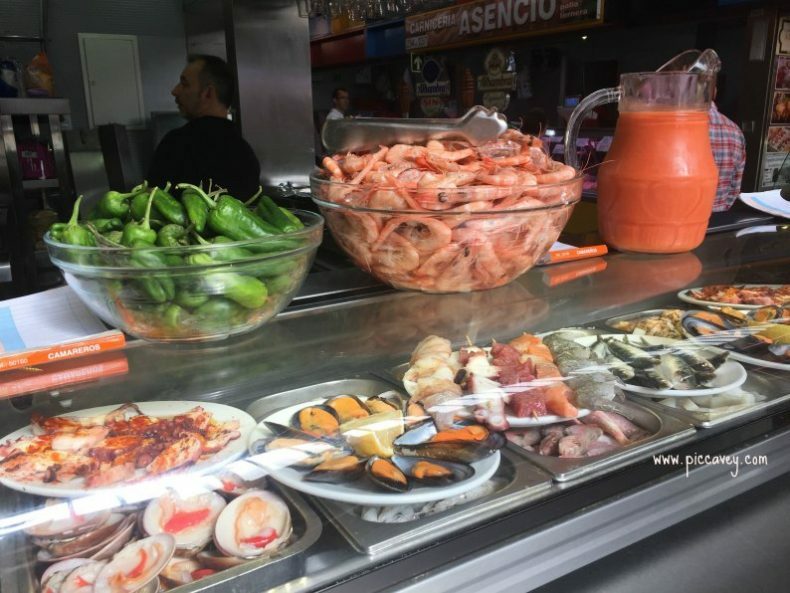 Selecting raciones is a good way to have lunch or dinner with a group by ordering in this way as people share the dishes in the centre of the table. You can eat a little bit of what you most enjoy. Raciones are ordered after having some tapas in a bar or restaurant. If you decide to stay and are hungry for more than a tapa. Choose a few raciones or half raciones. 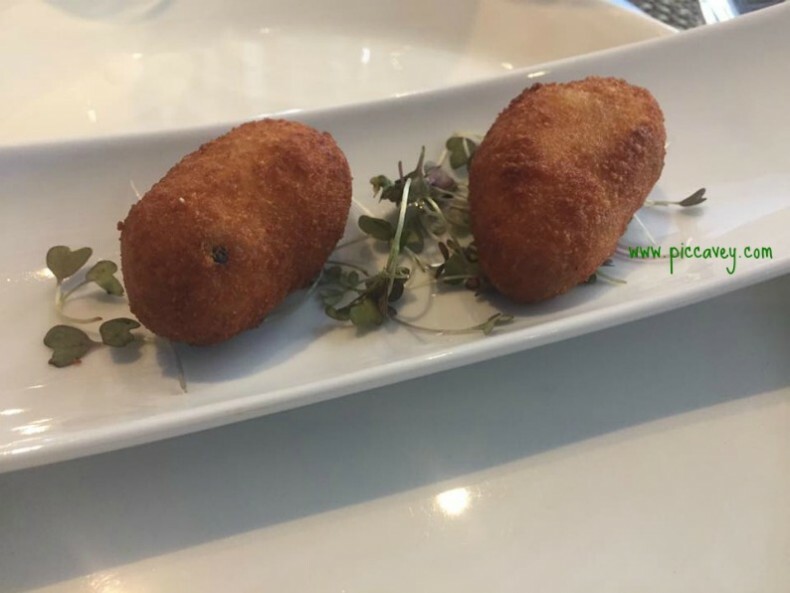 Raciones are usually varied and typically have fish, meat and vegetable dishes. In the North of Spain, you will often see the typical Pintxos. Similar to tapas they are usually more elaborate. The name originates from the stick they typically may have in them. (but not all of them do now) Pintxo is the basque word, but in Spanish it is Pincho. The price of each pintxo is usually the same. You pay according to the number of sticks left on you plate. There are many bars around Spain selling this type of food. One of my personal favourites used to be Maitea in Barcelona. When I lived in Barcelona I spent many evenings there with friends. What is a Montadito ? Something on top of a slice of bread. 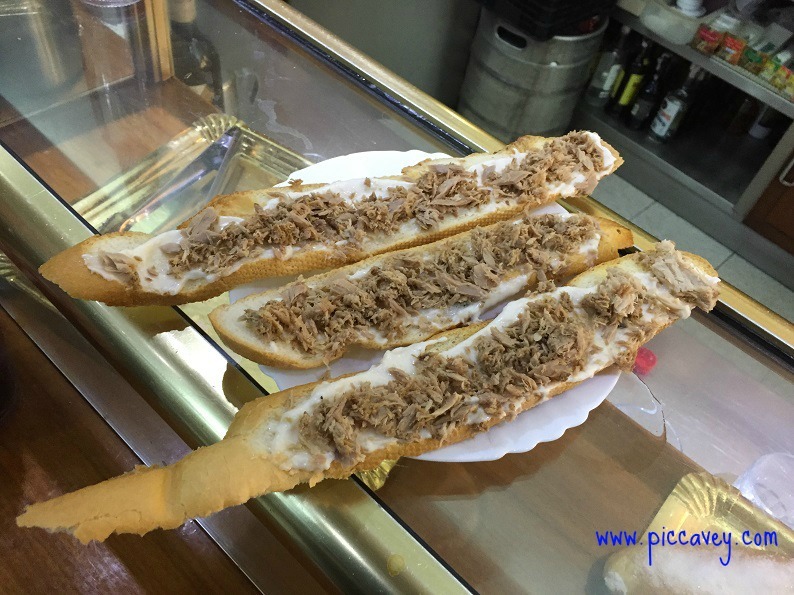 The photo below is a perfect example of a montadito. Although this was served in Granada, you can find montaditos all over Spain. Perhaps topped with Ham, cheese or even guacamole as the one seen on the top of this post. It´s like an open sandwich really, served on white bread, similar to baguette bread. These are most typical in Northern Spain and it´s where you will most easily find them. Across Spain chain restaurants like Lizarran and other Basque eateries have made them more popular and available outside of San Sebastian. I hope that you´ll be less confused next time you head out for tapas. This guide may avoid surprises when you order next time…..
Want to read about even more food? Great photos and articles Molly, read it whilst making lunch and I’m starving now! 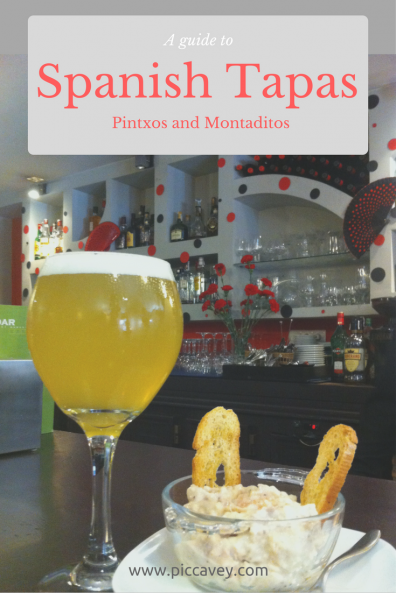 pintxos, montaditos, tapas & raciciones – Tasty Traditions. | La Rosilla – Lifestyle and food. Both interesting and revealing. I work in catering in the Canaries and never did know exactly what pintxos were? Now I do! Can I add Bocaditos to the list? Lovely little bite sized morsels of yumminess. Anything goes but you must be able to put a whole one into your mouth or boca in one go! Of course… the more food the better!!! These look sooo good! I haven’t been able to find food like this in Korea. I love Spanish tapas, and I’m craving them after seeing your photos! Ooh enjoy your break in Granada! Hey Molly! I live in Granada too and I’m curious as to where I can find those montaditos. The photo of those three montaditos was taken in ´La Pajuana´ last Summer in Calle Rosario. That´s at the end of the Calle Navas, as you walk from Granada Town Hall. 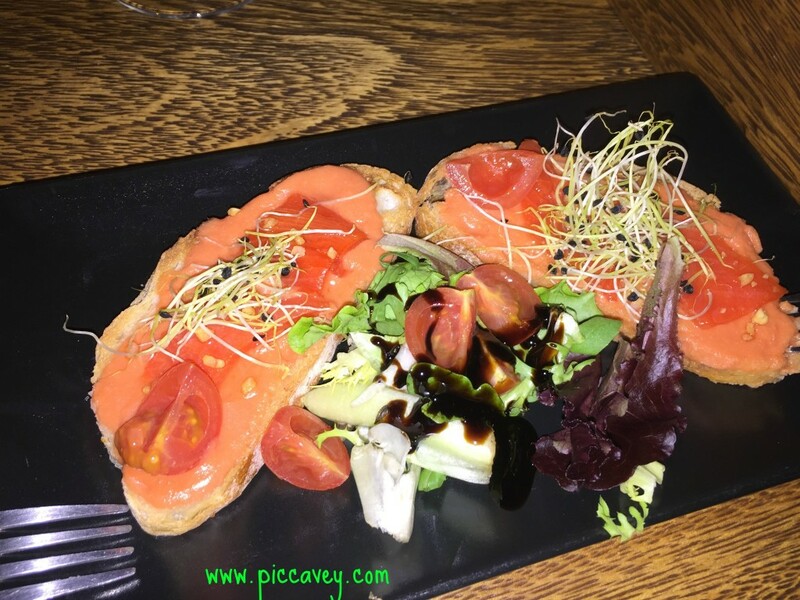 The Pintxos shown on this post was in Saffron Restaurant on one of their Special Basque Pintxos nights. What NOT to do in Granada – My Little Vagabonds! I love the deal with the sticks! Such good information. I had no idea of the differences and I’d never heard of raciones before. The free tapas sounds like quite a good bargain. I wonder if people suss out those places specifically, just so they can save on dinner? Yes Jody some people just get drinks and eat the free tapas. 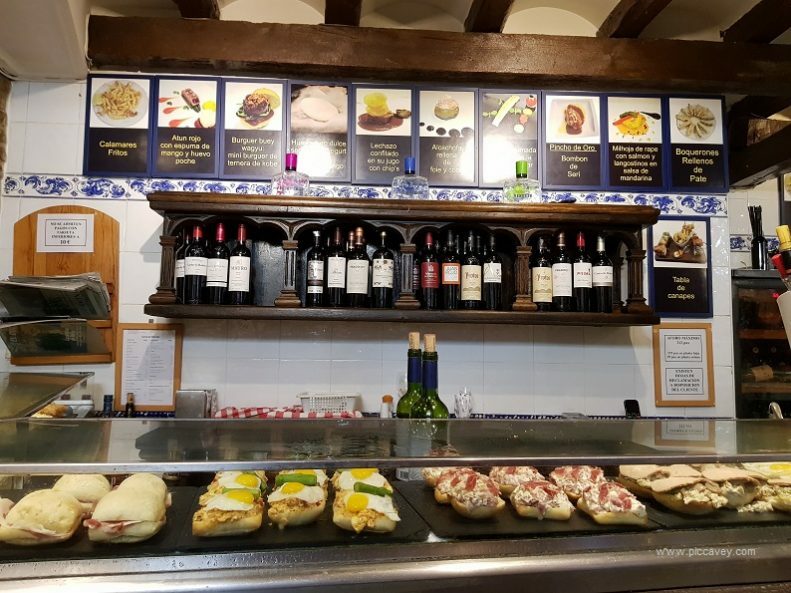 But the best way to eat out in Granada with the tapas is to choose one or two raciones as well as the free tapas so you can choose something you love. Interestingly, my wife and I visited a tapas bar in Almeria last week and chose a tapas each, my wife had wine and I had a small beer. A receipt was put in a glass on the table and the beer was missing. Having enjoyed the tapas we ordered some more and I had another small beer, which also did not appear on the updated receipt. Not sure how that worked. Strange, usually the tapas are complimentary when you have wine, beer or even sometimes ´refrescos´ like coca cola, fanta etc. I love Almeria and spend quite a few days there each year. I love tapas! Now I know I need to visit Spain in June for a few free bites! I also had no idea about the different names for tapas. Your post is so helpful! Tapas is such a great way to socialise over food. Great Blog. Using it for tips on our first trip to Granada in August – Hopefully the weather will be kind and not a burning sun so we can enjoy all our exploring and also some great meals. We wanted to eat at Recomiendo, but unfortunately they are closed for a summer holiday – any other suggestion appreciated. For great views of the Alhambra from the Albayzin Mirador de Morayma is ideal. 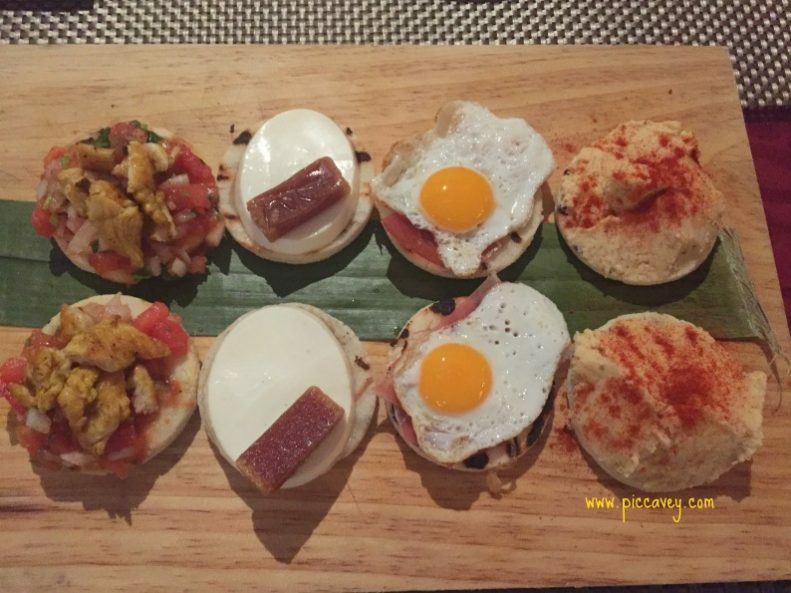 https://www.piccavey.com/princess-morayma-granada/ They serve local granada produce and typical recipes. The views from his 9th floor location are superb. His cuisine is based on excellent ingredients and a very elegant service to diners. You may also like Vega, a modern tapas bar in Realejo with a good wine selection.